I'm currently playing in a D&D 5e game with a DM who is relatively new to D&D. He has started creating his own rules for professions, and when I reviewed them I noticed that they were extremely similar to the actual D&D 5e rules. I therefore rectified his text and sent it back to him. The image here is the first draft, and below is the second draft with my corrections. You must be proficient with an artisan tools to know the profession. To learn a new profession you must spend 250 gp and 250 days with an appropriate teacher to gain proficiency with the relevant tool. 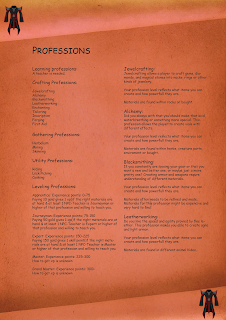 The following professions are currently available and require the corresponding artisan tool and proficiency to use the tools. Jewelcrafting allows a player to craft gems, dia­monds, and magical stones into necks, rings or other kinds of jewelery. The DC to create a specific item reflects the difficulty in creating the item. Combine this profession with enchanting to craft the magical gemstones. Materials are found within rocks or bought. This profession allows the player to create vials with different natural effects. The DC to create a specific item reflects the difficulty in creating the item. Combine this profession with enchanting to craft magical potions, oils, and ointments. Materials are found within herbs, creature parts, environment or bought. Use this profession if you are constantly losing your gear, want new and better gear, or want prettier gear. Creating armor and weapons require the understanding of different materials. The DC to create a specific item reflects the difficulty in creating the item. Combine this profession with enchanting to craft magical armor and weapons. Materials often need to be refined and made. Materials for this profession might be expensive and very hard to find. Do you like the speed and agility provided by fine leather gear. This profession makes you able to create agile and light armor. The DC to create a specific item reflects the difficulty in creating the item. Combine this profession with enchanting to craft magical armor and gear. Materials are found in different animal hides. Would you like your weapon to have a magical property? Or your boots to give that added speed? Refer to the enchanting rules below. Materials are rare and unique to the recipe. Do you like fine fabric, silk, string and needles. With this profession you are able to create wonderful stuff. Materials are web, silk, string. Rare componants might be needed for greater creations. Unlike enchanting, this profession allows you to bind spell scrolls directly to items. The DC to create a specific item reflects the difficulty in creating the item. 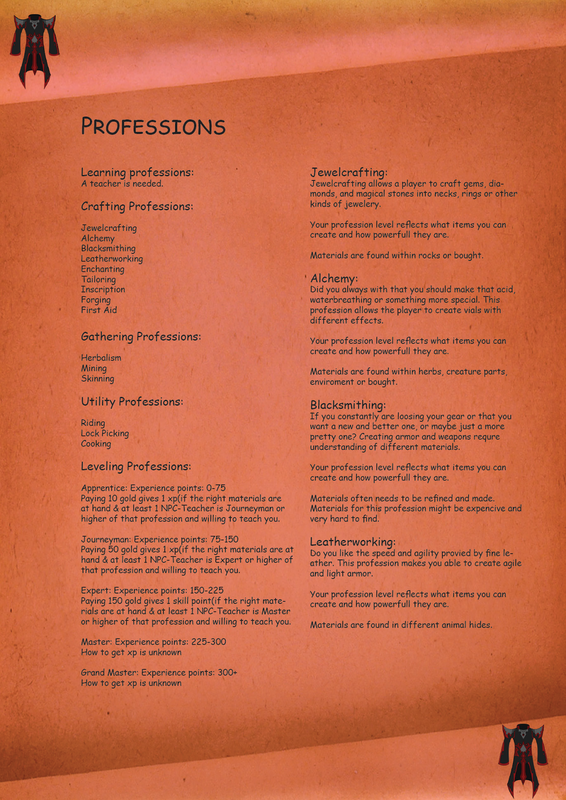 Combine this profession with enchanting to craft scrolls or imbue items with magical writing or people with magical tattoo. Mounts? Flying? More speed? Road Travle? Taking care of animals? More Speeeeed? Chests? Locks? Doors? Solving Puzzles? Items? Cause, don’t hide stuff from me! The campaign benefits when characters have time between adventures to engage in other activities. Allowing days, weeks, or months to pass between adventures stretches the campaign over a longer period of time and helps to manage the characters’ level progression, preventing them from gaining too much power too quickly. Allowing characters to pursue side interests between adventures also encourages players to become more invested in the campaign world. When a character owns a tavern in a village or spends time carousing with the locals, that character’s player is more likely to respond to threats to the village and its inhabitants. As your campaign progresses, your players’ characters will not only become more powerful but also more influential and invested in the world. They might be inclined to undertake projects that require more time between adventures, such as building and maintaining a stronghold. As the party gains levels, you can add more downtime between adventures to give characters the time they need to pursue such interests. Whereas days or weeks might pass between low-level adventures, the amount of downtime between higher-level adventures might be measured in months or years.